On Nepal: What Should We Do and Say? I think there is a lot to learn from these simple statements of scientific methodology (from these two controversial and deeply respected scientists). A brief digression: The word agnosticism was coined by Prof. Thomas Henry Huxley in 1869. He took it from the Greek agnostos, a = without, gnostos = knowledge – and he used this term in scientific warfare against notions of spiritual or mystical insight (i.e., hunches from the gut). This did not mean that Huxley was wishy-washy: on the contrary, he is famous as “Darwin’s bulldog” because on matters where there was sufficient emergent knowledge he fought so fiercely for the most advanced understanding. In April 2006, after long years of Maoist peoples war in Nepal’s countryside, a powerful mass movement broke out in the country’s urban areas demanding an overthrow of the hated monarchy. The Communist Party of Nepal (Maoist) initiated a series of political shifts, seeking to deepen its political connection with the rebelling urban masses — moves which the party describes as a part of its creative approach toward the seizure of power. As part of this political offensive and accompanying negotiations, the Maoists agreed to move their armed forces into “cantonments” under international supervision and to store its weapons in nearby depots. 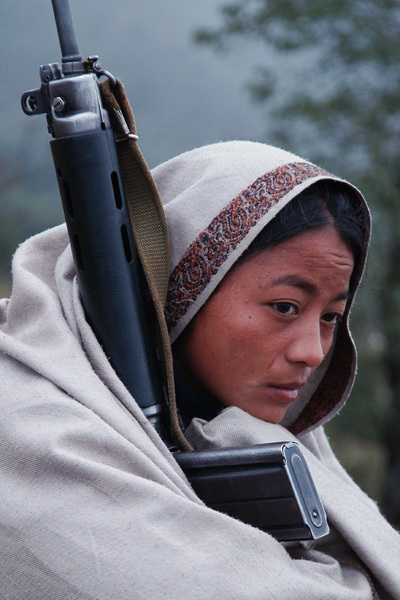 This suspension of the armed struggle has been highly controversial among communists internationally — as have other tactics of the Nepali Maoists which depart from certain “models” of communist revolution rooted in previous revolutions. Some forces have argued that these moves would inevitably lead to the dissolution or smashing of the revolutionary armed forces — i.e. to the disarming of the masses and the abandonment of the revolutionary struggle for a new society. Because of that controversy it has been particularly interesting to read the following recent account of the Peoples Liberation Army forces in a canton located in the lowland areas close to the Indian border (and the Indian army). 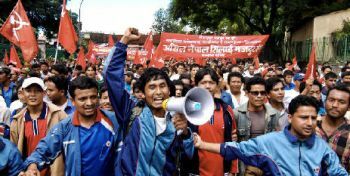 Street demonstrations in Nepal’s capital in September 2007 when the Maoists pulled out of the government coalition in protest over the refusal of other forces to overthrow the ancient and hated monarchy. The second edition of RED STAR has just appeared. This is the new online English language newspaper reporting on the Maoist revolution in Nepal. I am printing it all out for a close read. However I do want to call to attention a brief-but-significant passage in an interview with Netrabikram “Biplab” Chand, who is described as a member of the Secretariat of the Central Committee of the Communist Party of Nepal (Maoist). This passage acknowledges that the Nepali Maoists are facing criticisms from some forces internationally. Everyone has seen the criticisms of the Maoist of India (so that part is not a surprise). But Biplab also specifically mentions Bob Avakian of the Revolutionary Communist Party, USA as one of those doing the criticizing. This too is not surprising — because almost anyone watching the RCP realizes that they simply stopped writing their own commentary on the Nepali revolution in the Spring of 2006. Such an abrupt end to their previous enthusiastic reporting was an obvious sign that they had differences with the CPN(Maoist) that amounted to a cessation of support. This article appears in Issue #20 of The Red Star. The central committee meeting of Communist Party of Nepal (Maoist) has decided to run an ‘awareness of nationality and development campaign’ for the next four months. The meeting has also approved the single document presented by Chairman Prachanda with the working policy ‘People’s Federal Democratic National Republic’. Dharmendra Bastola, a central committee member of CPN (Maoist), said the party is going to carry out a campaign to solve the outstanding problems of nationality, democracy and livelihood. The CC meeting that was held on various days from December 8 ended on December 15. The meeting also decided to form a newer front between the patriotic and republican forces. This decision has come at the time when Nepali Congress, some Madhesi parties and royalist elements are trying to form a ‘democratic alliance.’ This development shows the sharp polarization of two different forces.